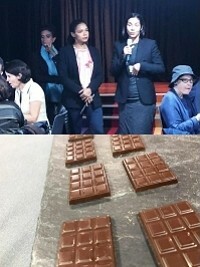 On the sidelines of the IFTM Top Resa International Tourism Fair 2018, Marie Christine Stephenson, the new Minister of Tourism, invited by the Ambassador of Haiti in Paris, Vanessa Lamothe Matignon, participated at the beginning of the week in a high-level tasting of Haitian chocolate, on a barge moored on the Seine. The chocolate consumed was produced by no less than five French chocolate chefs from Haitian cocoa (certified fair and organic) grown in particular by the cooperative FECCANO https://www.haitilibre.com/en/news-9779-haiti-agriculture-the-haitian-cocoa-recognized-as-one-of-the-best-in-the-world.html . This chocolate was presented, tasted and appreciated by about 80 gourmets and chocolate specialists. Invited to speak Ambassador Vanessa Lamothe Matignon, insisted on the history and the heritage aspect of cocoa in Haiti, pioneer of this culture in the colonial era. For her part, Minister Stephenson emphasized the singularity of Haitian cocoa in relation to our climate and its potential role in reforestation.